Sprawling over 27 acres/ the accommodations are individual guest cottages each with their own private garden. Each cottage features a front porch with a rocking chair and data ports. Guests are greeted with vaulted ceilings/ French doors and windows that flood the cottages with natural sunlight. Cottages are furnished with fireplaces/ flat screen televisions/ state of the art sound system and high speed internet access. Napa Ballroom: The Carneros Inn Meeting & Events Spaces are the ideal location for an executive board meeting, offering a comfortable environment with contemporary conveniences. Sonoma Ballroom: The Carneros Inn Sonoma Ballroom is an ideal location for an executive board meeting, offering a comfortable environment with contemporary conveniences. Hilltop Dining Room: The Hilltop Dining Room may serve as a meeting room or as an elegant dining room. Brazilian cherry wood floors invite your guests to meander from French Doors to banquettes to overlook rolling hills. Apple Orchard: The Apple Orchard is adjacent to the vineyard, with spectacular valley views. This spacious grand lawn is surrounded by three varietals of apples to include Wine Sap, Pippin and Braeburn. 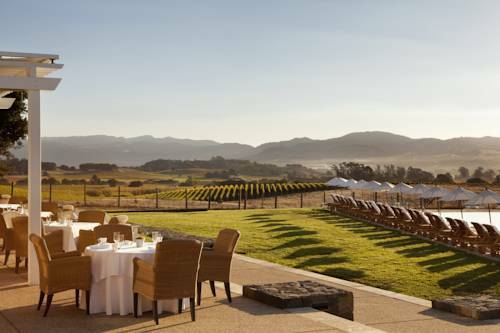 Carneros Resort is located on 27 acres in the heart of Carneros/ a region rich in agriculture and viticulture. Ideally situated between the Sonoma and Napa valleys. The Town of Napa is 5 miles north of the resort and is home to restaurants/ theaters/ Napa Opera House and Copia/ America*s cultural center for the study of wine/ food and the arts. The world renowned wineries of Napa and Sonoma are conveniently accessible.